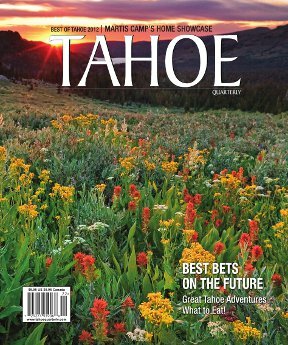 We are extremely fortunate at Tahoe to be surrounded by natural beauty, which includes a great diversity of plants and animals. More than 300 species of birds have been recorded in the Lake Tahoe Basin and many of these, such as the Steller’s jay and mountain chickadee, are quite conspicuous throughout the year. Tree squirrels are a common sight, and chipmunks and ground squirrels are ubiquitous in the summer months. 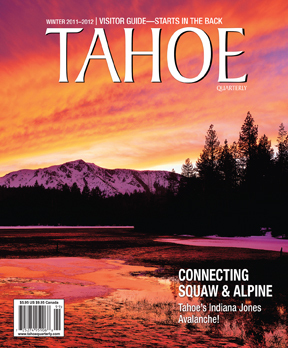 Many Tahoe residents and regular visitors can become quite accustomed to seeing larger wildlife as well. Coyotes regularly patrol ski area parking lots at the end of the day, brazenly trotting through South Lake Tahoe neighborhoods in broad daylight or streaking through traffic while making their rounds. Deer are a regular early morning sight in the summer in some areas, and bear spottings can become borderline boring for the truly jaded. But there is one group of animals that are rarely seen and they always elicit excitement and awe when they reveal themselves: the cats. 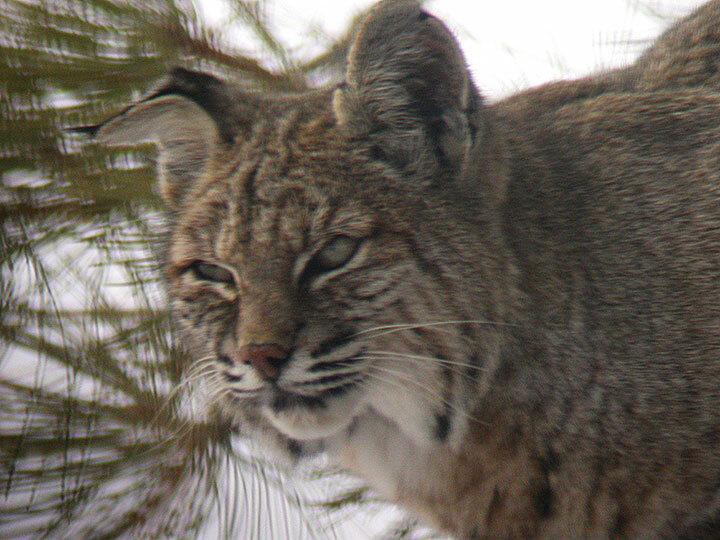 The smaller of Tahoe’s cats is the bobcat (Lynx rufus), which occurs throughout much of the region and is surprisingly common. However, being predominately nocturnal and extremely shy, Tahoe’s bobcats typically do a terrific job of being not seen. I say “typically” because I have seen quite a few over the years, from all parts of The Lake and even one slinking through downtown Truckee. In my experience—and Facebook postings certainly corroborate this—sightings are most common in winter, when the difficulties of securing food drive bobcats to drop their guard by hunting more openly during the day and venturing into residential neighborhoods in search of bird feeders and unwary suburban rabbits. Small, immature females appear barely larger than a house cat and may be dismissed as such. Larger bobcats, with a full, gray winter coat and thick sideburns, are often mistaken for Canada lynx, but that species does not occur in this part of the country. With people using their yards far less during the winter, bobcats may shift their patterns of movement to regularly bring them into view from picture windows. Indeed, for several years, a rough-looking tom would nap on my back fence in Truckee’s Glenshire neighborhood. 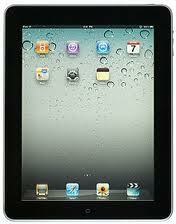 He was highly recognizable due to one bent ear, scars on his face and a slight limp coming from his back right hip. I can only imagine the sort of battles that led to such wounds. I haven’t seen that cat in many years, but others have passed through or behind my yard almost every winter since. Tahoe’s other cat species is one I have never seen, despite countless days in the field as a biologist, and that is the mountain lion (Felis concolor). This species is far less common, occupies wider home ranges and is much more elusive, all of which reduce the odds of intersecting with one. Even our remote cameras deployed to detect snowshoe hare and white-tailed jackrabbits, which have snapped dozens of bobcat images, have failed to capture a photo of a mountain lion. 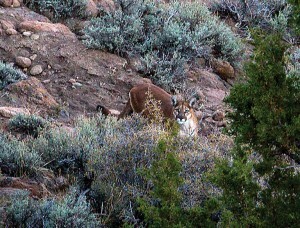 But we do have mountain lions here at Tahoe, and luckier folks than I manage to see them from time to time. One such person is Alyson Andreasen, who recently completed a Ph.D. at the University of Nevada, Reno, studying mountain lion movements in the Carson, Virginia and Pine Nut mountain ranges. She estimates that the Carson Range—the range forming the Nevada side of the Lake Tahoe Basin—holds fewer than 15 mountain lions in a given year. This is a speculative estimate based on the very high quality of the habitat in the Carson Range, but would include only two adult male territories, overlapping with several smaller female territories (plus all their kittens) and perhaps a few non-territorial sub-adults. When you consider the entire length and breadth of the Carson Range comprising those few territories, it is no wonder the cats are so seldom encountered. According to Andreasen, the undeveloped areas around Truckee are very high quality mountain lion habitat as well. Mountain lions’ diet includes smaller prey such as rabbits, porcupines and even coyotes, but primarily consists of deer. Tahoe’s deer migrate to lower elevations in the winter, and the lions track these migrations to follow their principal food source. When the deer return upslope in spring, the lions return as well. Unlike the deer, however, they prefer to keep their distance from humans and neighborhoods. With so much open space surrounding Tahoe’s developed areas, they still have a relatively easy time avoiding people—and biologists!